Winds blew from the northwest causing rough conditions in the Sound and out on the ocean. It also ushered in much colder air, making it feel more like Fall! A handful of boats headed out into the Pamlico Sound for a fair to good day of Drum fishing. Two boats headed offshore with one returning early. The other party braved the conditions and released a Sailfish. 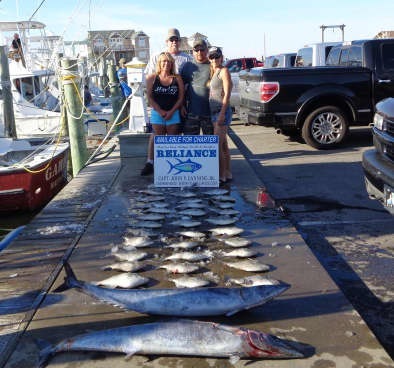 They ended up with a mixed catch of Wahoo, Dolphin, Yellowfin Tuna, Blackfin Tuna, and King Mackerel. Way to go, guys! Better weather is forecast for this weekend - want to go fishing? Give us a call at 800-676-4939 and book the charter of your choice. Bertie Cartwright of Bath, NC: Sailfish release on Release. Some rain came through this morning bringing in much cooler temperatures. It did not dampen the spirits of some hardy inshore anglers who went out for a good morning catching Speckled Trout and Drum. 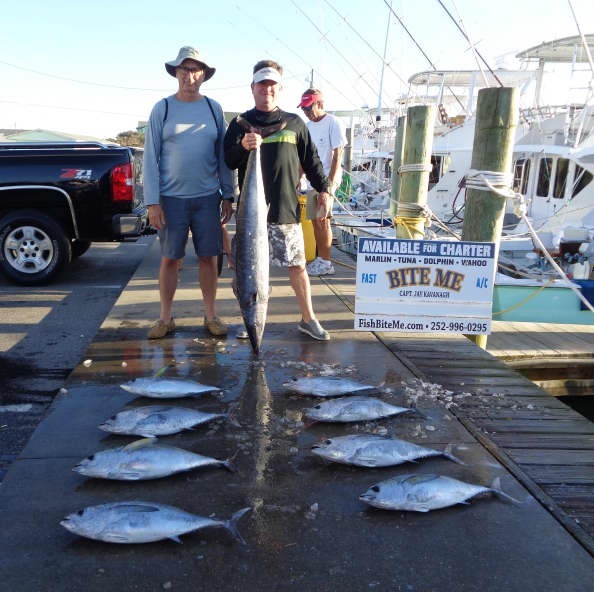 Only two charters ventured offshore. 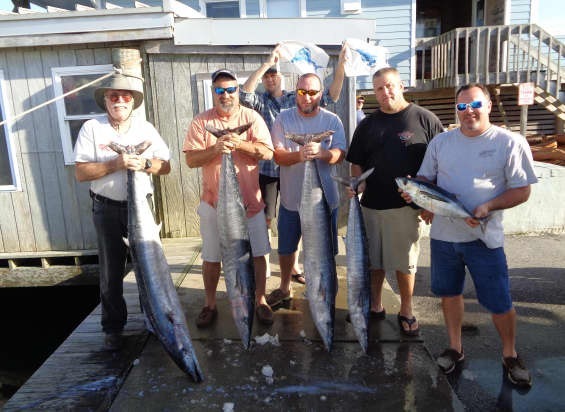 They focused on King Mackerel and returned with a fair to good catch. 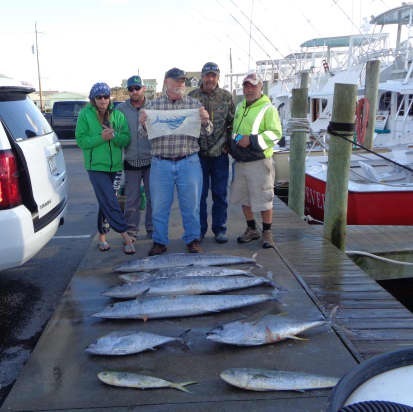 One group bottom fished for Amberjack and just as the fish hit, a big rain squall came through and drenched everyone. Sounds like a good time! High winds kept the boats at the dock today. We spent the day getting our 2018 calendars started, so if you are thinking about days for next year we will be able to hook you up soon. Weather was cooler today with overcast skies and rain in the early morning. A few Yellowfin Tuna and Wahoo today as well as a Sailfish released by Release. A few King Mackerel and Triggerfish as well rounded out the day. Not a red hot day of fishing but the gorgeous day more than made up for it. Inshore boats were catching Flounder last evening and today were on the Red Drum and Speckled Trout. We had a Manatee come for a visit today not a sight we usually have. Release: Tim Hollins of Bumpass, VA released a Sailfish. A good number of boats headed offshore this morning, they enjoyed a beautiful sunny day with lite winds. 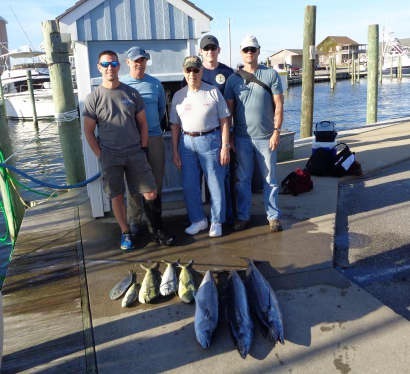 They returned with some good catches of Blackfin Tuna and Dolphin. 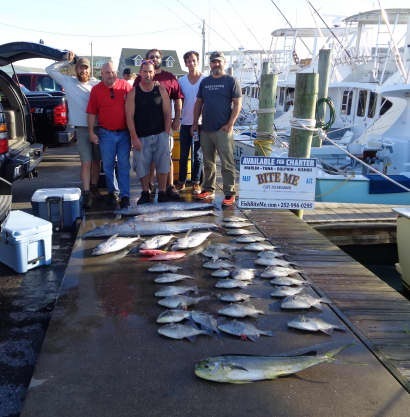 Bottom fishing produced lots of Trigger fish, Snapper and Amberjacks. 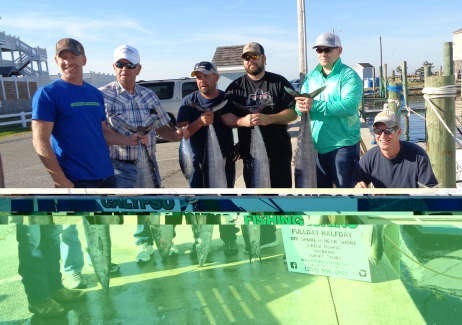 The wahoo bites were a little scattered. Tuna Duck released a Blue Marlin and there were more seen. 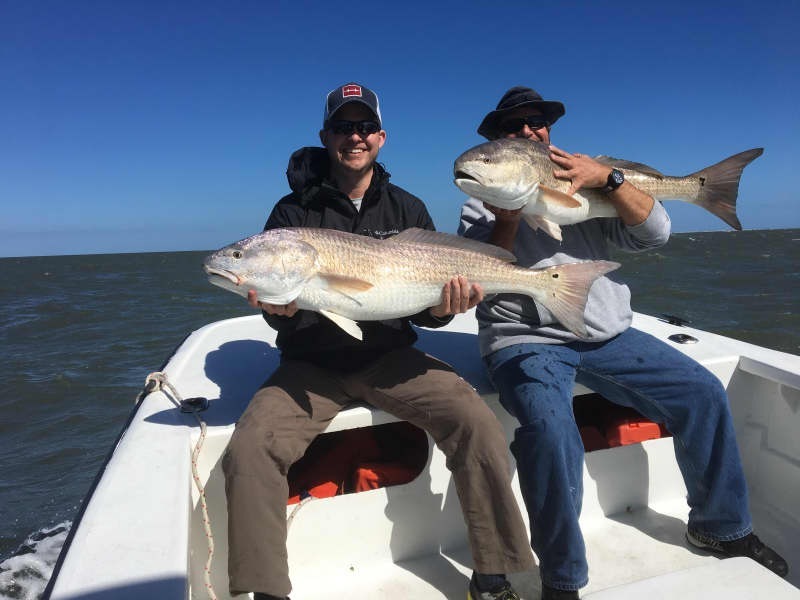 Inshore anglers had a great time catching keeper Red Drum and limits of nice sized Speckled Trout. It doesn't get any better than this - no wind, temps in the 70's, and plentiful sunshine! Inshore charters struggled with their catches this afternoon, but this morning they caught some Speckled Trout, Bluefish, and Gray Trout. Lots of big Drum were released. Conditions offshore improved today. Four Sailfish were released. Dolphin, Wahoo, and Blackfin Tuna catches were good. 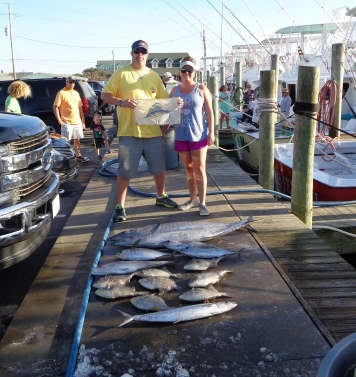 A few King Mackerel were brought in and bottom fishing for Triggerfish and Vermillion Snapper continues to be good. 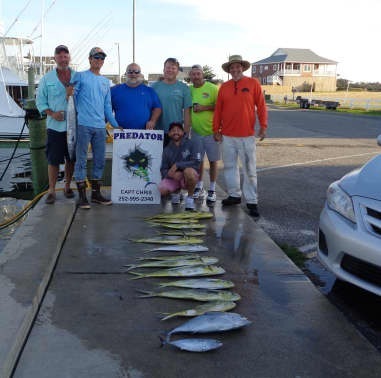 We need 3 anglers for a Make up charter on Sunday - call 800-676-4939. 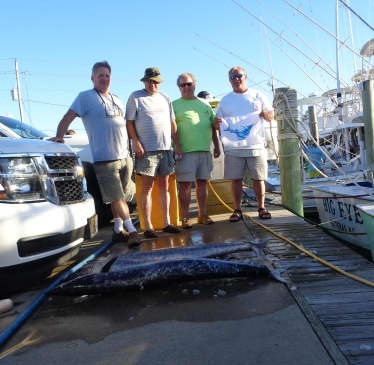 John Culp of New London, NC: Sailfish release on Release. 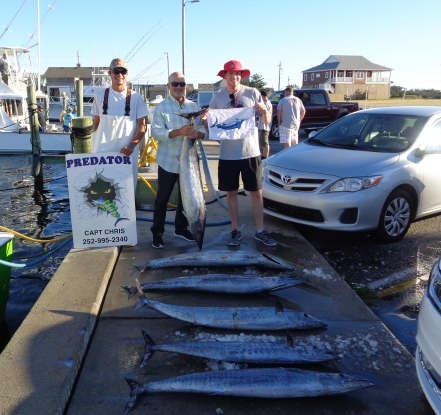 Troy Ward of Elizabeth City, NC: Sailfish release on Sea Creature. William Matthews of Elizabeth City, NC: 47 lb. Wahoo on Sea Creature. 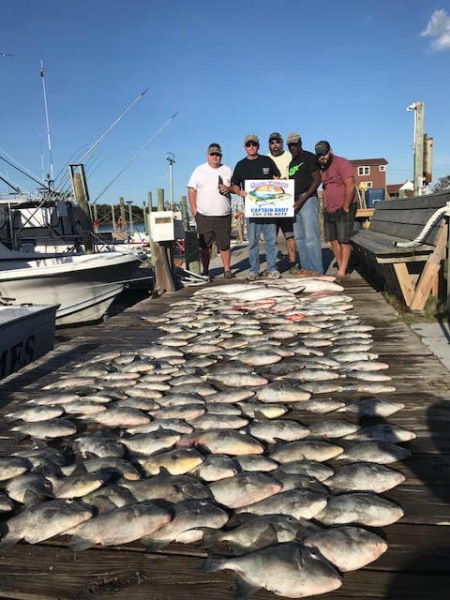 Ronnie Farr of Elizabeth City, NC: 45 lb. Wahoo on Sea Creature. 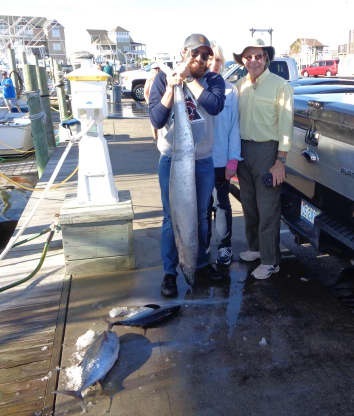 Nicholas St. Laurent of Camden, NC: Sailfish release on Sea Creature. Otto Miller of Elizabeth City, NC: 49 lb. Wahoo on Sea Creature. 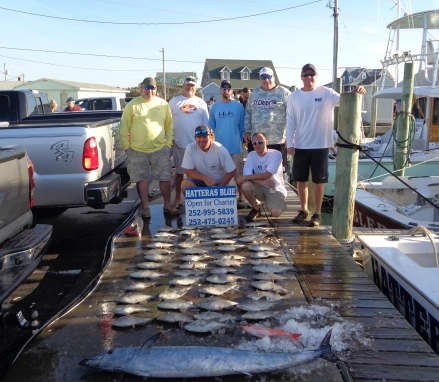 Jeff Roberts of Kernersville, NC: Sailfish release on Lucky Chip. Thomas Roberts of Kernersville, NC: 60 lb. Wahoo on Lucky Chip. It has been an absolutely beautiful Fall day on the island! 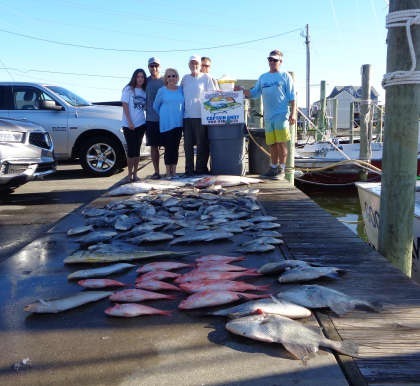 Inshore anglers returned with a mixed bag this morning. 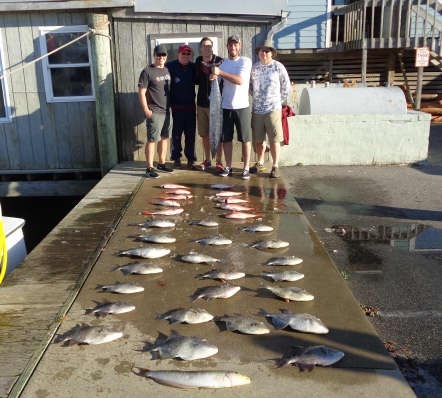 One party returned with Flounder and Sheepshead, another with Red Drim, and one with Speckled Trout and Bluefish. Conditions were much slower this afternoon, but the parties had a great time spending time with friends and family on the water! It's still a bit scrappy offshore - a few Wahoo and Blackfin Tuna were caught. Bottom fishing was pretty good with Triggerfish and Vermillion Snapper. 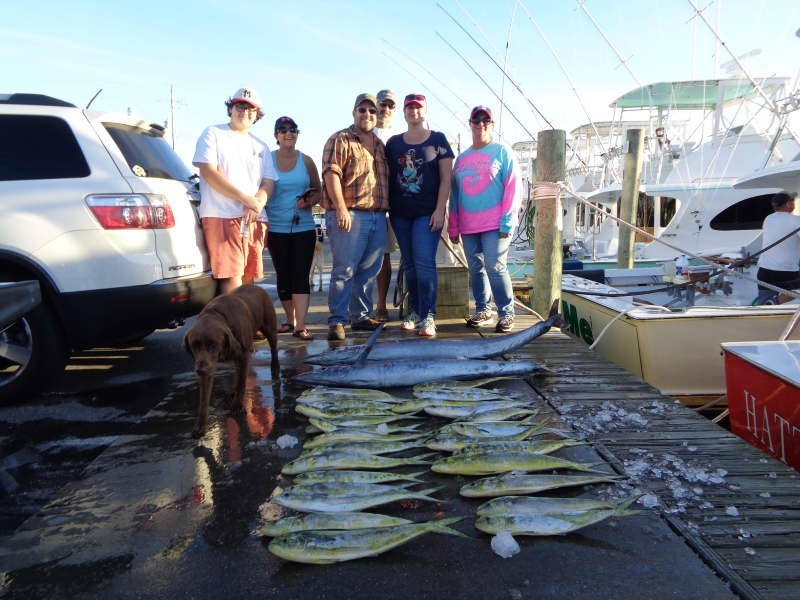 A Blue Marlin and a Sailfish were released. We still need people to fill a Make up charter for tomorrow or Sunday - give us a call at 800-676-4939. John Waggoner of Pineville, WV: 6lb. Triggerfish on Good Times. Adrian Waggoner of Pineville, WV: 6lb. Triggerfish on Good Times. Todd Negri of Federal Heights, CO: 49lb. Wahoo on Reliance. 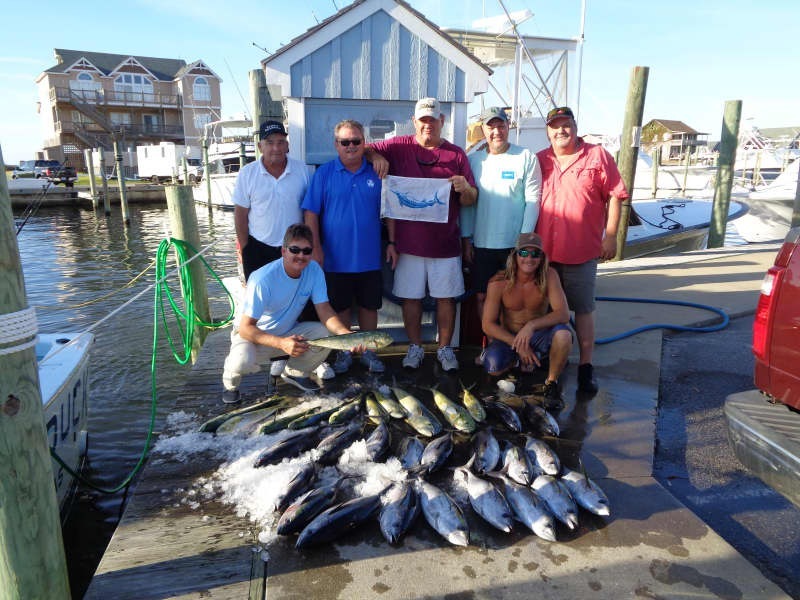 Chip Allsopp of Bay Head, NJ: Sailfish release on Native Son. Lawrence Garvey of Frenchtown, NJ: 48lb. Wahoo on Native Son. Michael Blonder of Atlanta, GA: 46lb. and 49lb. Wahoo on Predator. Zachary Blonder of Atlanta, GA: Blue Marlin release and 41lb. Wahoo on Predator. Calypso: Triggerfish: Bob Linster of Exmore, VA 5lbs. Randall Carrington Jr. of Charlotte, NC 5lbs and a 44lb Wahoo. Keith Latham of Mocksville, NC 5lbs. Tom Gagnier of Mocksville, NC 5lbs. Jason Stewart of Mocksville, NC 5lbs. Andrew Whitley of Davidson, NC 5lbs. 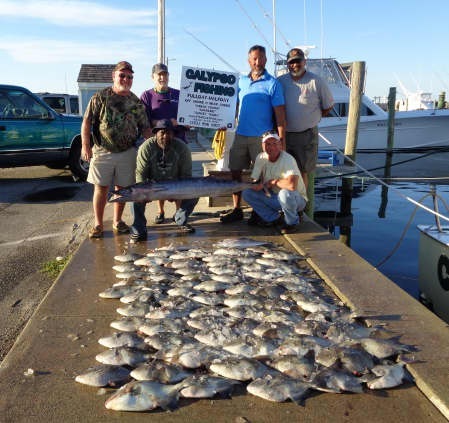 Inshore anglers took advantage of the early fall weather to enjoy a great day of fishing the Pamlico Sound. 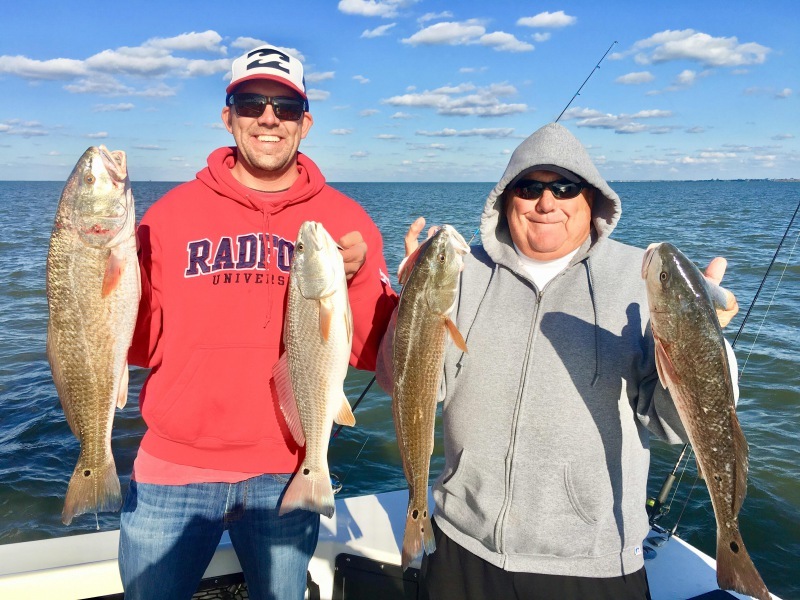 Speckled Trout fishing was excellent with limits of Trout - " a nice class of fish, BIG"! 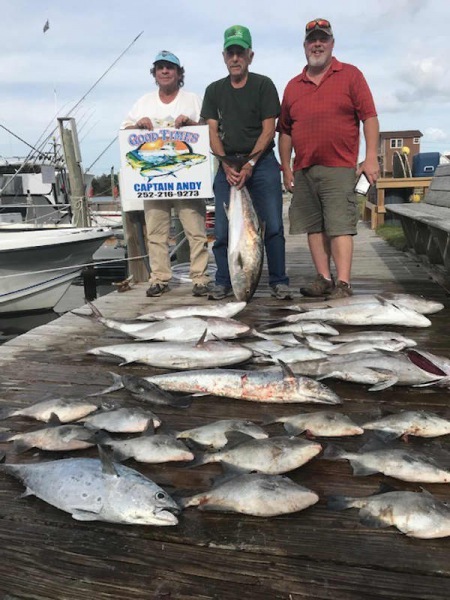 The Drum bite was on again today with limits for the charters. 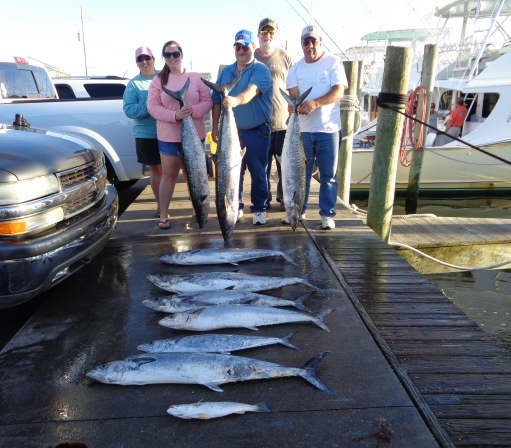 One offshore boat ventured out and returned with a good catch of King Mackerel. Looks like the Fall fish have arrived. 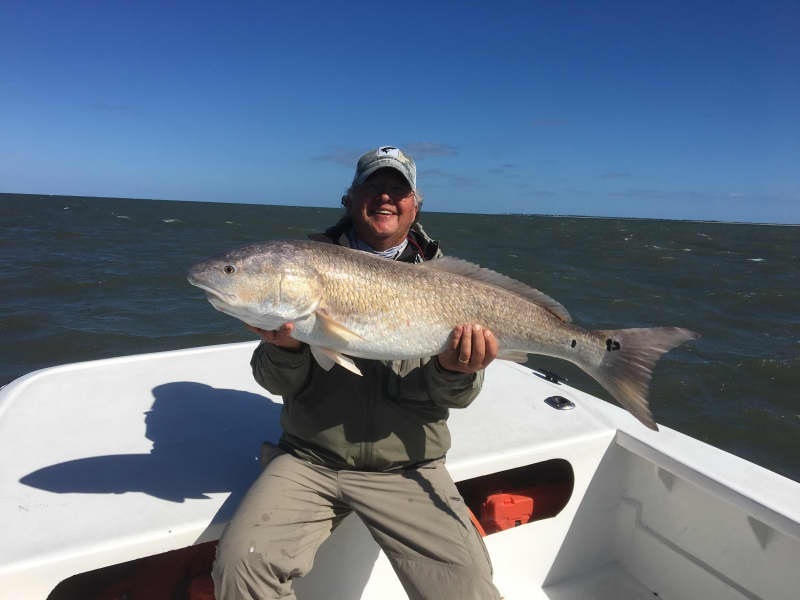 John Hudgins of Yorktown, VA: 41" Red Drum release on Hook Up. 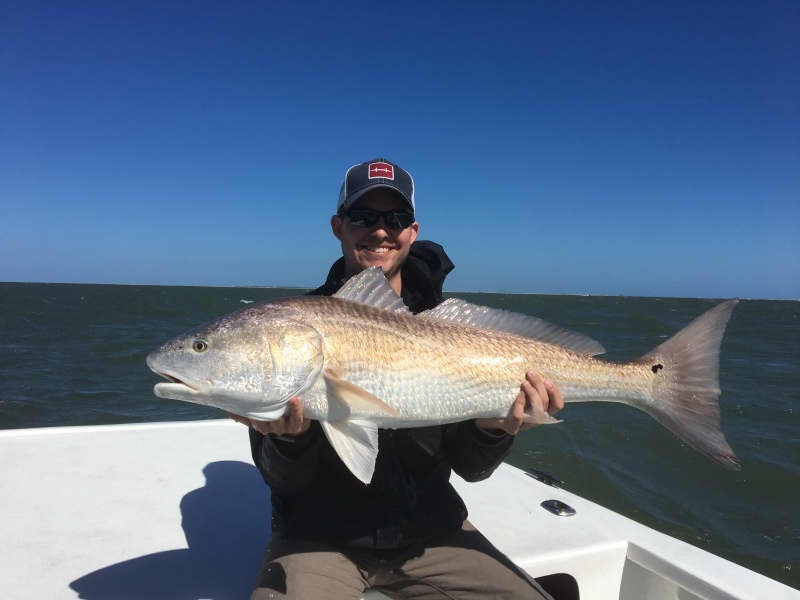 Henry Hudgins of Flowery Branch, GA: 41" Red Drum release on Hook Up. We are currently looking for 3 to 4 people to fill a make up trip for Friday (20th) or Saturday (21st). Give us a call if you are going to be in the area and want to go fishing. 1-800-676-4939! Rough conditions kept all offshore boats docked today. 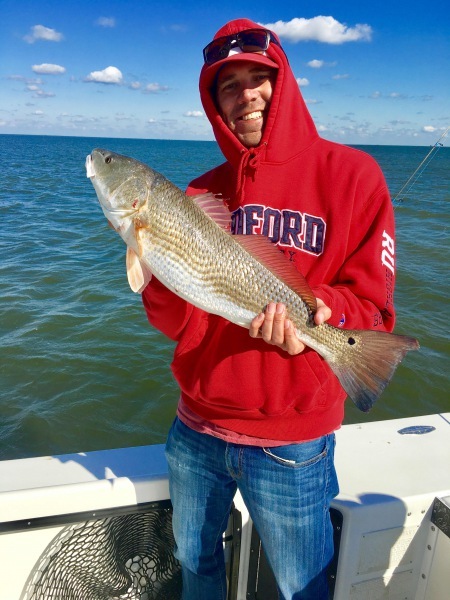 Inshore charters ran out into the Pamlico Sound and had a good day catching and releasing big Red Drum. Much cooler air moved in with the northeast wind but temperatures are supposed to be above normal with good fishing conditions this weekend. Don't miss out on all the fun! Clifford Lewis of Lewisville, NC: 2 42" Red Drum releases on Tradition. Daniel Lewis of Charlotte, NC: 40",41", and 45" Red Drum releases on Tradition. Richard Washabaugh of Lewisville, NC: 40", 3 41", and 42" Red Drum releases on Tradition.